With more than 39,000 square feet of event space, the Hilton Columbus at Easton is ideal for any wedding event, whether it be an intimate ceremony or a large-scale wedding reception. 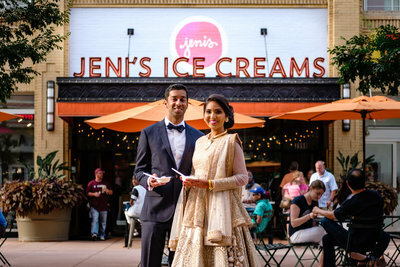 In addition to the four main event spaces, there are also over 8,000 square feet that can be used for cocktail party spaces, welcome parties, and post-wedding festivities. The Easton Grand Ballroom is the largest space on the property with over 10,000 square feet. Perfect for a party of up to 700 dinner guests or 1,200 for a ceremony, this traditional ballroom area allows for banquet-style seating as well as a spacious parquet dance floor. Known as their junior ballroom, the Regent Ballroom encompasses 5,200 square feet making it ideal for up to 300 people for a seated dinner or up to 600 for a theatre-style ceremony. The room can also be broken up into three smaller spaces to accommodate a small ceremony and an intimate seated reception. The Juniper Room is a 2,720 square foot space that is perfect for up to 130 people for a seated banquet or 200 for ceremony seating. Columbus, the newest venue space, is a charming 1,300 square foot room with lots of natural light that can seat up to 80 wedding reception guests or 125 for a ceremony. 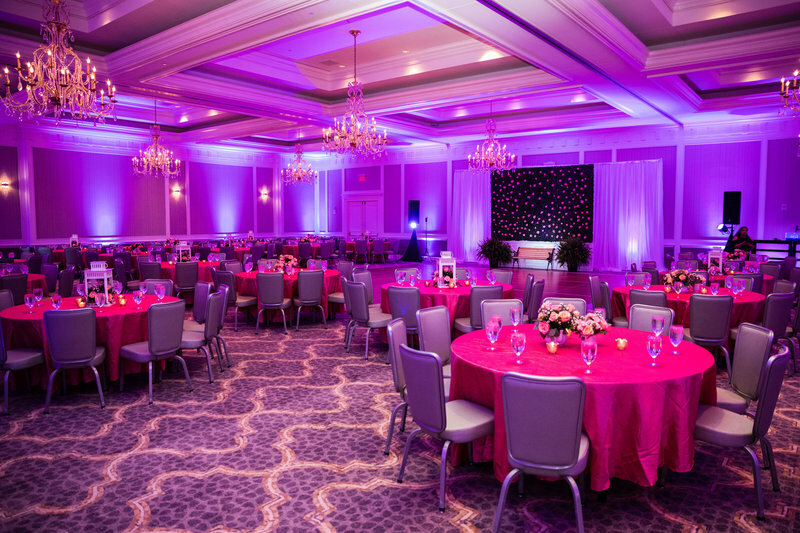 In addition to the main wedding venues, the Hilton Columbus at Easton also has numerous areas that can be used for an array of wedding activities such as a wedding shower or a farewell brunch. There are two 1,000 square foot rooms as well as four small boardrooms that all are perfect for parties of 100 people or less. Four different foyer areas are also available that can be designed to serve as an extra party space for cocktail areas or for formal photo shoots. According to the event staff at the Hilton Columbus at Easton, a wedding for 100 guests starts at approximately $6,500 to meet the food and beverage minimum for one of the ballroom venues. There is an additional 24% service charge as well as 7.50% sales tax. A ceremony fee is an additional $500 and also has service charge fees as well as a sales tax. Situated at the center of the dynamic Easton Town Center, the Hilton Columbus at Easton offers the perfect blend of high-end amenities and first-class accommodations. Perfect for a wedding, this location gives guests and the wedding party access to a thriving location all while enjoying the charm and style of a luxury hotel. Built in 2000, the Hilton Columbus at Easton is a seven-story, 345 room upscale hotel that includes 39,000 square feet of conference and event space. Though large in scale, this hotel was built in a style reminiscent of a stately manor home with a Georgian Revival-style brick exterior and a grand cupola as its centerpiece. The interior of this full-service hotel was completely redesigned in 2017 with over $27 million put towards upgrades and amenity enhancements. The lobby was completely renovated and now boasts high-end marble accents and a warm decor with rich colors and textures. 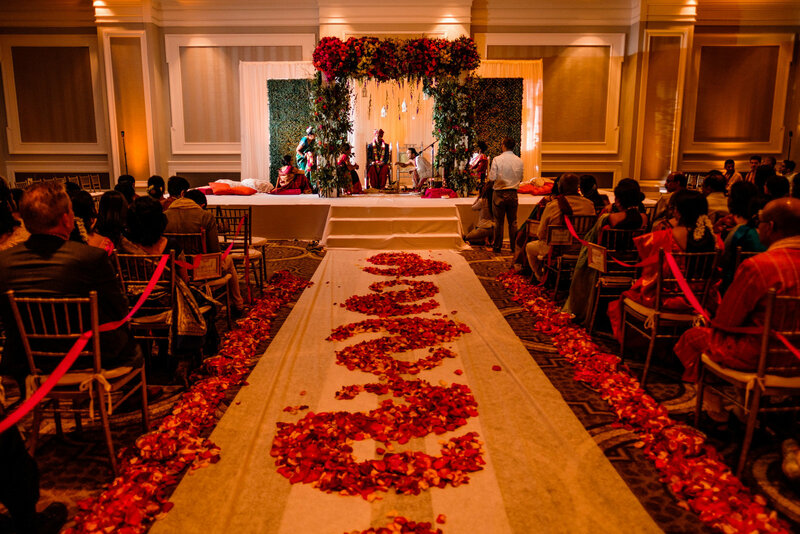 Click to see Navya & Navin's incredible wedding at The Hilton at Easton.